Links to the articles written by Forrest that go with these pictures listed below! for graciously permitting me to post these wonderful stories! 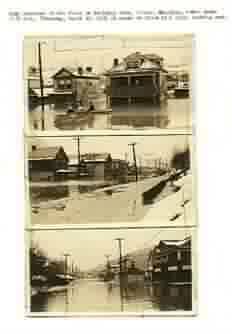 Some pictures of the flood on National Road, Fulton, Wheeling, taken about 3:30 p.m., Thursday, March 19, 1936, at crest of flood 55.6 feet. Looking east. 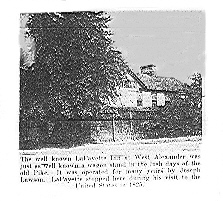 The LaFayette Inn in West Alexander, razed several years ago, by the owners of the Grimes Garage and wood from inn used in the building of the garage. 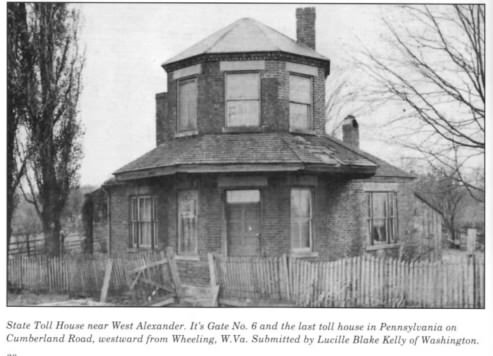 The West Alexander Toll House, razed several years ago, by the owners of the land it sat on. 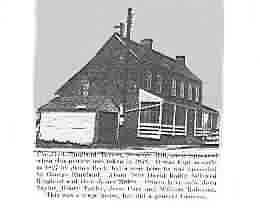 The pictures seen above are of the old Toll House that stood on the old Routh 40, just east of West Alexander. This is one of the few remaining toll houses still standing but is is badly in need of repair. 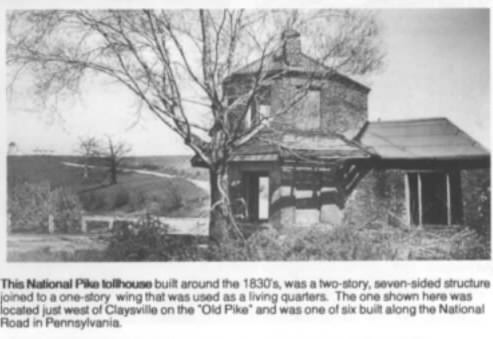 These buildings are practically the only link remaining with the historic National Pike of by-gone years. At one time they were located every few miles to collect the tolls from the almost endless stream of vehicle traffic, moving westward and carrying the lifeblood of this ____ section. 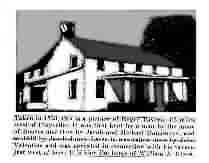 Here is the Sign of the Black House Tavern, a noted hostelry in its day, as it looked in 1953 on the National Pike in Claysville. 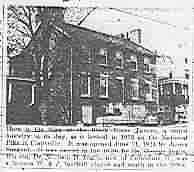 It was opened June 11, 1821 by James Sargent. It was owned in the 1870's by Dr. George Inglis. His son, Dr. William D. Inglis, now of Columbus, O., was a famous W. & J. football player and coach in the 1890's. Still standing in 2000. The "S" Bridge west of Washington is an engineering marvel. 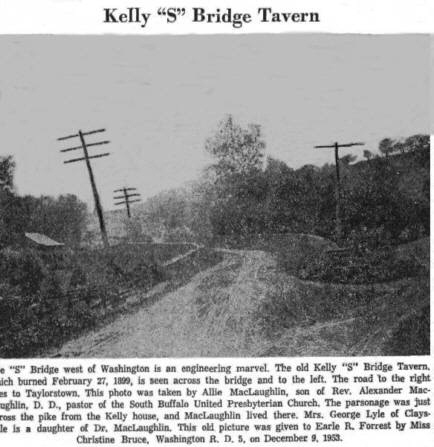 The old Kelly "S" Bridge tavern, which burned Feburary 27, 1909, is seen across the bridge and to the left. The road to the right is to Taylorstown. This photo was taken by Allie MacLaughlin, son of Rev. Alexander MacLaughlin, D.D., pastor of the South Buffalo United Presbyterian Church. 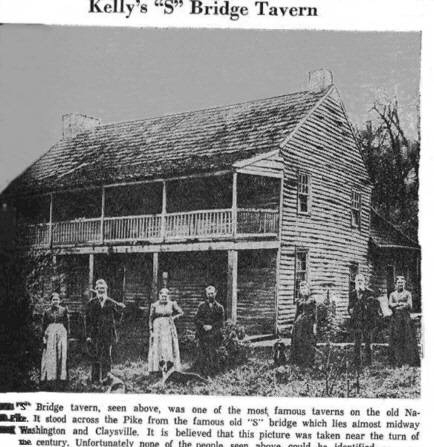 The parsonage was just across the Pike from the Kelly home, and MacLaughlin lived there. Mrs George Lyle of Claysville is a daughter of Dr. MacLaughlin. This old picture was given to Earle R. Forrest by Miss Christine Bruce, Washington R. D. 5, on December 9, 1953. 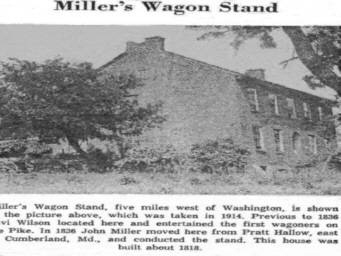 Miller's Wagon stand, five miles west of Washington is shown in the picture above, which was taken in 1914. 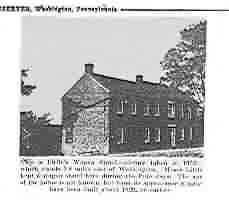 Previous to 1836 Levi Wilson located here and entertained the first wagoners on the Pike. 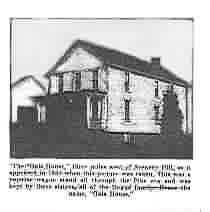 In 1836, John Miller moved here from Pratt Hollow, east of Cumberland, Md., and conducted the stand. 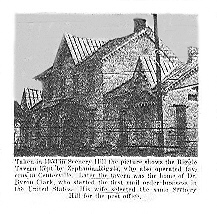 This house was built about 1813. Still standing in 2000! The East Maiden Street Toll Stop. 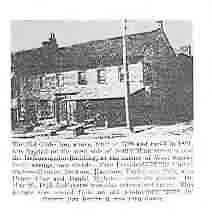 The above is the tollgate which formerly stood on East Maiden Street. 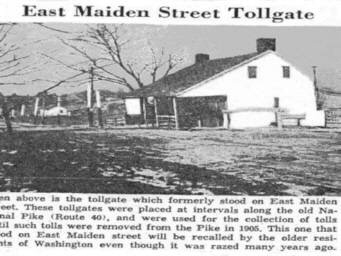 These tollgates, were placed at intervals alont the old National Pike (Route 40O, and were used for the collection of tolls till such time tools were removed from the Pike in 1905. this one that stood on East Maiden street will be recalled by the older residents of Washington even though it was razed many years ago.